That is a fantastic JBC Dr. Debito! Well done indeed. –Allowing this post through only as evidence of the “White Samurai” phenomenon I alluded to in my column. Readers, don’t feed the troll. Please, let’s hear more about ‘the horrors of Japan’. You need to wake up and smell the chrysanthemums! That’s the flower of the Imperial Family, in case you didn’t know. Let’s face it, you probably didn’t. In Tokyo, the largest metropolis on Earth, women can walk alone safely and securely at midnight (or later) without fear. Try that in Manhattan, Detroit, Downtown Los Angeles or Chicago. In Japan, young kids can skip down the streets and ride public trains without being harmed or abducted…while innocent children in America are being savagely slaughtered like beasts in their own classrooms! An opioid/heroin crisis is sweeping cities and suburbs while spreading disease, chaos and death. This after years of widespread cocaine, crack AND methamphetamine pandemics! The general public is desensitized to DUIs, gun violence, domestic violence and arrests. Millions of people are incarcerated and being housed in violent, human cages while being stripped of their dignity. Police brutality and corruption only highlight the countless flaws in the criminal justice system. According to the National Crime Information Center, between 627,911 and 932,190 people have gone missing (1990-2016) in the United States EVERY YEAR! Which means that over a half-a-million people have likely been either kidnapped, murdered (and never found), or human trafficked EVERY SINGLE YEAR. Men, women and children…but mostly CHILDREN! The country is in more debt than any other nation in the GALAXY. Meanwhile, no immigration policy to date has prevented millions of undocumented aliens from residing and dodging taxes in the country. To top it all off, vicious hate crimes against ethnic and religious minorities as well as LGBTs are all on the rise. So, what exactly can Japan learn from YOUR perspective as a former US citizen? There is NOTHING that Japan can learn from a country thousands of years its junior. There is no social institution or governance in America (and arguably the rest of the West) that is superior to Japan’s. PERIOD. You’ve obviously arrived at a point of comfort that has spoiled and deluded you with self-righteous narcissism. It’s made you take the beautiful country of Japan for granted. Smite her as you will, and I’ll continue to defend her honor! 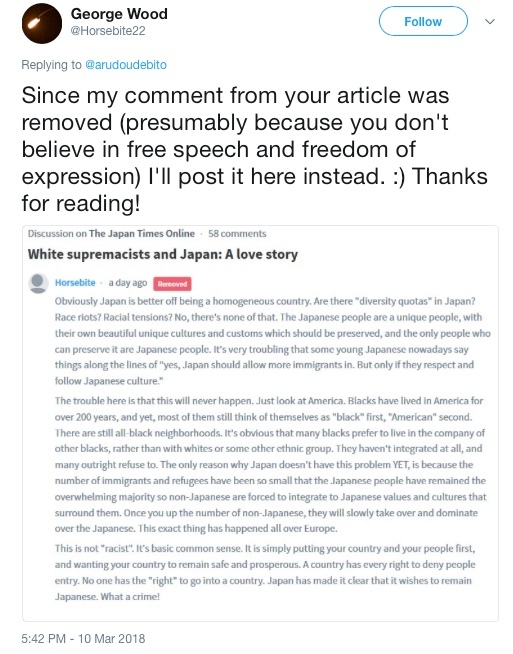 “White supremacists and Japan: A love story” —How DARE you!?!?! -Do your research and propose real solutions before you lazily construct/submit an article to be published. -Use LEGITIMATE sources not ‘Billy Bob from some random, racist forum’. -FULLY acknowledge that you have more to LEARN from Japan than you have to “teach”. LOLZ! Thanks for showing that Dr. Debito! This guy doesn’t know anything about japan except the ‘japan myths’ and seems to have a mental health issue. Ah, Sponge Bob panic attack. Sounds like Japanese version of Stephen Miller. This site is about Japan, and the boring old Japanese right is just the same old same old-except that certain upstarts like Sakurai dont know their place and get taken to task by other rightists like Hashimoto. They just bleat on about Imperial revisionism and “Nanjing didnt happen” as Japan is post-fascist. So indeed, American fascists/white supremacists like (the distant idea of) Japan. so does the British nazi, I mean National Party, who I see as traitors in light of Japanese war atrocities. I don’t see anyone on the Japanese right who is a classical liberal, who opposes PC SJW 3rd weave feminism or safe spaces etc etc because none of these things have happened in Japan. Japan, was, and always has been deeply conservative/nationalist/racist. It is problematic to compare america and Japan as what you see in America is something different, a reaction to Hilary style Democrats. Obviously that is strikingly different to a Japan that has only known the same old same old LDP. In America we are seeing political activism at the level of the 60s, interestingly another period of mass demonstrations against the Democratic establishment’s involvement in Vietnam. Disclaimer: I am not pro Republican and neither is Milo. the GOP is statistically more corrupt (other than Ford) than the Democrats, its true. Yes to be sure, some of these white nationalist losers might fantasize about Japan. I agree with most of the article but hang on, perhaps don’t lump in Steve Bannon with the fanboys and alt right nationalists here, as it is starting to sound like one. monolithic movement, and it certinly isn’t. Milo Yiannopoulos- of whom I am becoming something of a fan for his highly intelligent and entertaining debates- calls Bannon “uncle” yet rejects the alt right and most certainly, as a gay Jewish man married to a black guy, is not liked by the alt right at all. The feeling is mutual. and yet he worked for Bannon at Breitbart. I think Bannon said he “liked” Japan for different reasons from the others mentioned. In fact he said “Japan, as having become “protectorates of the United States” that do not “make an effort to defend [themselves]”, and ……..should pay a minimum of 2% of GDP on defense.wikipedia. So Bannon is wrong or just saying what Japan wants to hear when he says Japan was Trump before Trump. He doesn’t know Japan in depth like posters and Debito do. So much for all Abe’s omotenashi, it has availed him nothing. I’ll be controversial and bite. Who/ How about the answer being- the average, lower income white Caucasian male who is fed up of being told to “check his white privilege”? The “google memo” comes to mind. There is a big backlash against this from white Caucasian males in America, who do not feel “supreme” at all. WHAT white privilege, exactly? Just putting it out there for debate! Yep. “Whites are being discriminated against diversity” is a kind of a ridiculous argument they love to make. And that kind of absurdity is echoed by some Caucasian woman(a social studies teacher in Florida public school), who secretly made her own podcast to spread her white supremacy ideology to right-wingers. Wrong, I’d say. America is multi cultural, whites are becoming a minority in some states, they dont get any affirmative action programs. Thats completely different from Japan. All power remains with the Japanese. Anyone on the American right should not be lauding Japan. Try living here! What scares me more is how some on the American left mollycuddle Japanese as a repressed minority on a par with people from undeveloped nations. You know, really important stuff like how Gackt the millionaire popstar cant get the seat he wanted in a snooty French restuarant. “What’s mine is mine and what is yours is mine also”, comes to mind with Japan and Japanese abroad! @Dr. Debito, I’ve just been reading the JBC comments section. Jartaylor has responded! Apparently you’ve ‘got some nerve’ for exercising your legal right protected by the constitution of Japan, as a Japanese citizen, for speaking your opinion. For some reason (I’ll take a guess; ‘white-superiority’?) Taylor seems to think that his opinion should over-ride the Constitution of Japan and its application to Japanese citizens, and instead that he (presumably as a white American male) should be able to determine who is legally a citizen of Japan according to Japanese law and who isn’t. What a bizarrely pompous old windbag. ‘Dotard’ springs to mind. How many 16 year olds (high school first graders) have advice about politics, economics, demographics that you would take seriously? This guy last lived in Japan 50 years ago as a child. I’m very glad this finally came out. I have argued that western disregard of similar race issue in Japan for the sake of cultural uniqueness is a clear reflection of white privilege running amok. Those who attributes one’s decision to leave country as an indicator of like/dislike, and those who falsely link genuine criticism of Japan with anti-Japanese are no doubt chanting for the creation of problem. They are dumb hypocrites ‘paper liberal’ commentators who call for social justice on one hand, and accuse Muslims of being anti-Semites for criticizing Israel or its corrupted PM Benjamin Netanyahu on the other. Great article. I don’t always like or agree with your JT articles, but this one hit the spot. Japan in the 2nd decade of the 21st Century, reminds me of South Africa in the 8th decade of the 20th Century. You would get European migrants coming to South Africa, praising how Apartheid South Africa had not been corrupted by ‘Western’ ideas of multi-racialism / multi-culturalism. As an added observation, it was always amazing how Japanese nationals seemed so comfortable in Apartheid South Africa, with their honorary white status. Korean nationals weren’t much different, but at least their government took a stance of refusing to have any diplomatic relationship with the Apartheid regime. Good comparison. White apologists for Japan’s Apartheid system. I’m not surprised. I remember a few years ago I saw an internet post by a “Virginia Dare” (I suspect this may have been Peter Brimelow or someone else affiliated with the VDARE web site) criticizing Debito and praising Japan’s policies on ethnicity. I can’t remember the exact words he wrote, but this guy loved the idea that in Japan somebody who wasn’t ethnically pure would NEVER be considered Japanese, and neither would their kids or grandchildren. Japan needs to be called out on this. Peter Brimelow or someone else affiliated with the VDARE site will likewise never become Japanese but in addition, they will discriminated against in Japan these days as well. This isnt the 80s, lose the rose tinted gaijin guest nostalgia glasses, already! You know, that Taylor guy is still the 16 year old ‘gaijin, you’re NOT one of us ware-ware nihonjin’ in the corner of the classroom, and as an ‘adult’ it’s exactly the attitude he’s throwing back at the world. Scarred for life as a child, made carrying the chip on his shoulder his life’s work. Sad. PS: For the record: I have no control over what posts get removed at the Japan Times online; but I can certainly see why it was removed. That too, comedy gold. These people aren’t right. Japanese are unique….really, in what way? Their hair is black…aahh..no, other races have predominantly black hair. Their eyes are oval shaped…aahh, no other races have almond shaped eyes. They speak a strange language, er…so do many others, I could go on….thus please define ‘unique’. You need to understand the difference between a nationalistic narrative that has been coated with the veneer of being “unique” to install pride and what is genuinely ‘unique’. Just dividing, food, eating, clothes and language, culture etc as “Japanese” and anything else that is ‘different’ from this as non-Japanese isn’t unique, it is pure nationalism. Simple! The attempt to bring modernity and tradition into one “concept” is just nationalism; to think otherwise is just being gullible. So anyone or anything that is not-Japanese (not liking raw fish or rice etc) can be viewed through this nationalistic prism of being “less than Japanese” in other words, you are deficient in “something”. And since if by your definition, they are unique, then for the argument to be valid, the reverse must also be true, we are unique, to them! So, ive always wondered why Americans always refer to themselves as Italian-American, or Irish-American, or African-American or…and so on. If it is country first, why the reference to another? So are you denying black people in the US and their parents and grandparents etc, from entry into the US, oh wait, they were born there and already live there! Thus what has being black got to do with it? I think Adrian / Eido / Letteradegree / Bonesupren / Bonesdawg is trying to libel Debito again? I think his “Bonesupren” handle was discovered on October 20th? while pretentiously & deceivingly using the third-person? I think soon after the “Bonesupren” discovery he created his new handle “Bonesdawg” ? I think Adrian / Eido / Letteradegree / Bonesupren / Bonesdawg finally admitted to being ex-military? … we all would have done anything to protect any other member of our unit (family). I think Adrian/Eido was always hiding the fact he was ex-military, or even covertly-currently-military? Albeit CJ embarrassed this site when Adrian/Eido showed proof(?) of US-citizenship-renunciation. Still, though CJ lacked definitive proof, I think CJ was right about Eido/Adrian having been military? Just my opinion: I think Adrian / Eido / Letteradegree / Bonesupren / Bonesdawg finally admitted to being ex-military? Being ex-military (or even current-military) isn’t bad, I just think HIDING that fact for decades is? In summary, I think Adrian’s / Eido’s / Letteradegree’s / Bonesupren’s / Bonesdawg’s publicly-published archived-statements would have gone unnoticed, if he had simply chosen to CEASE-AND-DESIST from trying to libel Debito, and if he had simply chosen to CEASE-AND-DESIST from publicly posting Debito’s physical address as he did in October 2017, since that specific archived-act of physical-address-publishing which he committed could aid / abet / facilitate / encourage more death threats to be sent to Debito’s physical address by post or even lead to the increased chance of a physical attack upon Debito in the future? That’s something to think over. I’d always just assumed the he was a weeaboo with a chip on his shoulder that (from his point of view) ‘Japan hating Debito’ is a someone in Japan who gets paid to write his thoughts, whereas Eido the Japanophile is ignored and nobody wants to pay him for his thoughts. No doubt that the speculation that he might be ‘ex-military’ or even (gasp!) CIA will pump up his ego no end. Short-man syndrome to a T! I think, although the October discovery was correct, yesterday’s post was slightly mistaken? I think the October discovery contained sufficient evidence of whose alias was Bonesupren? But I think yesterday’s evidence about BonesDAWG was insufficient and merely circumstantial? I think, on one hand, there was circumstantial evidence linking BonesUPREN to BonesDAWG? #1. After proving Eido = Letteradegree = BonesUPREN, he deleted his “Debito’s address” post? #2. Around the same time a BonesDAWG handle was created, which then recently libeled Debito? #3. This similarly-styled new BonesDAWG handle also bragged about being a naturalized-J-citizen? But now I think, on the other hand, BonesDAWG is a DIFFERENT Debito-hating naturalized-J-citizen? I think this BonesDAWG character wrote that he lived briefly in Vermont, but Eido has never written that? I think this BonesDAWG character described himself as “ex-military”, but Eido has never written that either? I think this BonesDAWG character repeatedly uses a phrase, which Eido never used, which GMainwaring did? And BonesDAWG’s comment history crazily repeats that strawman lie about 18 times within 3 months? And GMainwaring’s “DadsArmy.co.uk” history matches BonesDAWG’s “ex-military” “chavs” phrases much better? Yet I think it is also POSSIBLE that BOTH sock-puppets typing the word ” ‘nym” in the following link are the same typist? I think it’s strange that Eido chose BONESupren, while GMainwaring seems to have chosen BONESdawg? I think it’s really strange that Bonesupren and Bonesdawg are BOTH Debito-hating naturalized-J-citizens? I think it’s absolutely absurd that any naturalized-J-citizen would honestly deny Embedded Racism in Japan? I think yesterday’s point #1 still stands, Eido shouldn’t have published Debito’s physical address last October? I think yesterday’s point #2 still stands, this NEW “coincidentally-named” Bones character tried to libel Debito? And I think the main point still stands: that the U.N. CERD Treaty which Japan signed in 1995 must be enforced. — Thank you for the sleuthing, but this isn’t really the subject of this blog post. Duly noted. Let’s move along. Well, if anything, it proves the extent ‘white samurai’ will go to in order to ‘defend’ Japan from critics, and realizing that their methods are distasteful, aliases are needed. Sad. I on the other hand, need an alias to protect myself from them! They are mentally unstable! They defend their “ideal” of Japan, because they are in denial of the reality of Japan. Perhaps we all did this in the “honeymoon” phase, only to have our ideal image that had been sold to us by Japan’s PR machine slowly chipped away, disappointment by disappointment, microagression by microaggression. The difference is their ideal is one of discrimination. I am curious to know how they think they themselves would fit into such an “ethnically pure” Japan?